Happy 30th: Women & Children First Reviewed by Edgeville Buzz on September 16, 2009 . 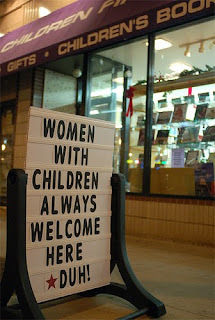 Check out this article in the Windy City Times about bookstore owners Linda Bubon and Ann Christopherson’s 30 years running Women & Children First (5233 N Clark). They will also be hosting a 30th Anniversary celebration and benefit gala with a buffet dinner, drinks, dancing, fund-raising auction & entertainment on October 3rd at the Breakers. For more info and tickets click here.